Located in the village of Abries, this hotel is set at the heart of Queyras Regional Nature Reserve. It features a traditional French restaurant and guest rooms, some featuring a balcony. Guest rooms are decorated with wooden furniture and all feature a private bathroom. Each room is heated and equipped with a flat-screen TV and free Wi-Fi access. The restaurant at Chalet de Lanza serves homemade ice-cream and organic wines. There is also a bar with a terrace offering views over the landscape. A breakfast buffet is served every morning. 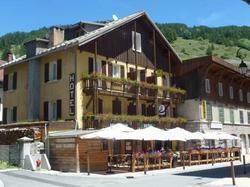 With free public parking available nearby, the Lanza Chalet is located 35 km from Briançon. Activities in the nearby area include hiking, horse-riding and tennis. Please note that during April and May the restaurant will be closed for dinner. Other restaurants are available in the village. The property will only provide bed and breakfast in this time. This room features a flat-screen TV, wooden furniture and a private bathroom. Offering a balcony, this spacious room features a flat-screen TV, wooden furniture and a private bathroom with shower. Offering a balcony, this room features a flat-screen TV, wooden furniture and a private bathroom. This room features a flat-screen TV, wooden furniture and a private bathroom. Some of the rooms have a balcony.